Sometimes to follow Cicero's maxim, "To be, rather than to seem", is not that simple. "I took a series of photos with ISO bracketing, but FastRawViewer shows them all in the same way on the main window, even though the JPEG previews are different. I think you have a bug!" In answering him, we suggested several reasons as to why this is happening (in FastRawViewer, Auto-ETTR is turned on, Auto-ETTR was used manually...), among which was the option that "It's possible that your camera doesn't even do anything when the ISO is changed," (such examples are known, starting with the Canon's ISO 50, but in general there are a lot of them). The user sent us the files, and the result was...exactly that; the automatic change of the ISO setting while bracketing didn't affect the RAW data at all. Because we didn't have permission to publish those files, we asked another user with the same camera to take sample shots for us, and below you can see the results. As such, we would like to formally introduce you to Fujifilm X-H1 in ISO bracketing mode. The description is not entirely obvious, but we can clearly see the words "sensitivity raised," which promises Good Things(TM). In search for those good things, we've examined a few series of shots taken with Fujifilm X-H1 in ISO bracketing mode (three of such series are on the screenshot below, displaying 9 embedded JPEGs, 3 for each series; the reason they're greenish is that they were shot in UniWB). 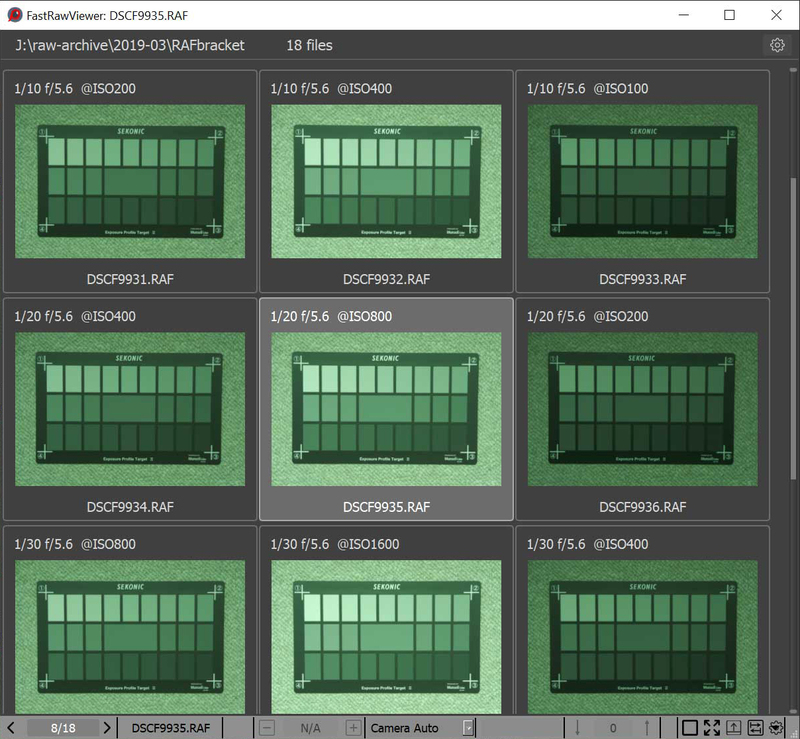 As you can see on the screenshot, EXIF data indicates that only ISO setting changes in each series, while shutter speed and aperture stay the same. The lightness of JPEGs changes accordingly to ISO setting, by ±1 stop. This all looks like real bracketing so far. Which, in turn, is not at all surprising because only one shot was ever taken, the RAW data of which was later recorded to each "bracketed" shot. Thus, if you intend to shoot in RAW, then the ISO bracketing mode on this camera is completely pointless for you (considering the illusions that emerge as a result and the wasted space on the flash card, it's actually somewhat harmful). It's obvious that for digital cameras, bracketing by ISO only makes sense if the raising of ISO decreases read noise, but that does not hold for all cameras and through the whole range of ISO settings. Nonetheless, not doing anything to RAW data is unexpected, one might even say it is beyond the pale. A quick look through the manuals of other Fujifilm cameras revealed the fact that it is not only in the X-H1 that bracketing by ISO was done in this manner. The same description is contained in the manuals for X-Pro2, X-T3 (X-Pro1 as well, but it's inconvenient to hyperlink to this description directly - so, please go to the page 35 manually). To Be or To Seem: WYSIWYG or WYSIWYM? On one hand, showing identical (with regards to the data) RAW files as being different will only confuse (not enlighten) the user. On the other hand, all other software displays such shots with different lightness and the user is confused as well. On the third hand, we already process Fujifilm tags, for example "DynamicRangeSetting," and comparable tags for other cameras (this is, in essence, underexposure by several stops, which leads to an increase in the headroom in the highlights and the dynamic range, in the everyday photographic meaning of the word, is also increased - it actually isn't: the sensor is the same, but the the amount of clipped highlights is decreased because the exposure is now lower). Consider these tags "like all" (for now, only for the X-H1, but based on reading the manuals we will have to do this for the entire X-series) with the settings on default. If someone wants to see the real RAW exposure, then one will need to uncheck the 'Apply Adobe hidden exposure correction' checkbox (like for other tags). The cause of this is a lack of standards: "ISO speed and ISO speed latitude values shall not be reported for raw images, however, because with raw images processing that affects the values has not been performed" (ISO 12232:2019).